Maryland Mommy: Review: Covertly record audio anywhere with the new WEEFUN Wristband Recorder! Review: Covertly record audio anywhere with the new WEEFUN Wristband Recorder! What I love: Do you wish you could covertly record any audio, anywhere? 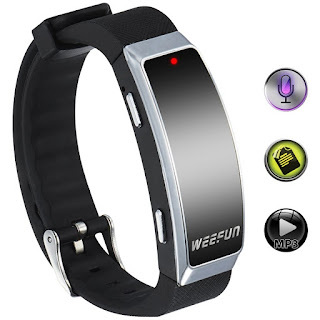 You can with the new updated WEEFUN Recorder Wristband. Looks like an activity band but records high quality audio anywhere you want to! I have one and I love it! I have worn it to concerts, meetings, anywhere I want to remember and listen again! Made of plastic and rubber this recorder wristband looks like your average fitness band, but contained inside is actually an 8GB hard drive that is ready to record everything around you with the flip of a switch. The band is super comfortable and it's virtually unrecognizable as a recorder. Using it couldn't be more simple. Flip the switch to ON and a small LED will flash indicating recording has started. The device contains advanced noise cancellation so you are sure to get the best quality no matter if you are recording yourself or another person talking, a lecture in a large classroom or even a concert! Once you are done recording switch the wristband to OFF to save your recording. Want to listen right away? No problem, just plug in your earbuds and turn it on. The buttons on the side allow you to select the file you want to listen to and control the volume. You can even hook it to the computer and backup the files or add your own MP3s to listen to your own music or audio anywhere you go! You can use it with the included earbuds which are really comfortable with good sound or any 3.5mm jack headphones, earbuds or speaker. That makes this even more versatile. All my recordings came out clear! I was amazed to see the difference between recording a rock concert on my cell phone and on the wristband. My phone uses a compressed audio format and was really hard to understand and full of static and background noise, but the wristband uses uncompressed high quality WAV format and sounded almost exactly as I had heard it myself! I was totally sold hearing the difference between the two! The hard drive in the wristband is formatted FAT32 so it will easily read on both a PC and a MAC. The only issue I have heard is that people may need to update their chipset USB drivers before use, just like any USB accessory. If you need help with this WEEFUN Customer Service is happy to assist you! That's actually one of the things I like best about WEEFUN products, is their new updated manuals. They are really thorough with explaining every part of the recorder, unlike other models on the market. And they have amazing customer service! Just contact them at their customer service email and they are happy to go out of their way to help you solve any issues you may have with their products. WEEFUN is an awesome company. I give their products and their customer service both a 5 out of 5 and highly recommend them!